Now in Bangkok! 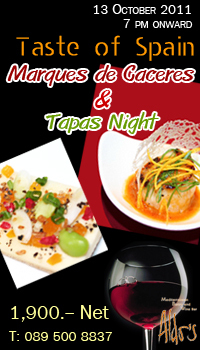 World's Spanish Best Wine "Marques de Caceres", Brand Ambassador, Mr. Xavier Vicente will introduce and get you through the best "Tapas Night" in Bangkok! Limited to 18 guests in Bagnkok only! Book now to avoid disappointment.